Ipilimumab, marketed under the brand name Yervoy and manufactured by pharmaceutical giant Bristol-Myers Squibb, is an immunotherapy treatment for late-stage melanoma. Clinical trials are testing Yervoy in people with mesothelioma, and early results are promising. Yervoy was approved by the U.S. Food and Drug Administration (FDA) in 2011 to treat metastatic melanoma that can’t be removed by surgery. In 2015, approval expanded to treat stage 3 melanoma in conjunction with surgery to reduce the risk of recurrence. Research is underway to evaluate the benefits of Yervoy in mesothelioma treatment. A phase III clinical trial is testing Yervoy in combination with nivolumab (Opdivo) as a first-line treatment for mesothelioma patients who do not qualify for surgery. The SMART protocol, which applies radiation therapy before surgery, is adding immunotherapy with Yervoy in a new study. A trial in the Netherlands is testing Yervoy and Opdivo as a treatment for mesothelioma patients whose cancer has progressed or returned following chemotherapy. A phase II trial in France released preliminary results that 50 percent of mesothelioma participants are positively responding to Yervoy in combination with Opdivo. Two other trials are testing Yervoy and Opdivo in combination with another immunotherapy drug known as INCAGN01876 in people with mesothelioma and other cancers. Early results are promising and indicate Yervoy is effective against mesothelioma when combined with Opdivo. Yervoy is an immunotherapy drug that increases the activity of your body’s T cells. T cells are white blood cells that travel throughout the body searching for infections and cellular abnormalities such as cancer. Yervoy is thought to increase how effectively T cells recognize and attack cancer cells. This increases your immune system’s natural defenses to help kill cancer cells. Yervoy is a highly active drug for the treatment of melanoma. More than 2,000 late-stage melanoma patients have received the drug since 2010. Approximately 20 percent have greatly benefitted from it. The five-year survival rate for late-stage melanoma patients treated with Yervoy is 18.2 percent. Among melanoma patients who are diagnosed early enough to qualify for surgery and receive Yervoy, the five-year survival rate is 65.4 percent. Researchers are hopeful a similar effect will play out with mesothelioma patients. The potential benefits of Yervoy are not without the risk of side effects. Some side effects, such as fatigue, are minimal and go away when treatment ends. Other side effects are more serious, such as the risk of developing nerve problems or colitis (inflammation of the inner lining of the colon). Treating side effects early minimizes the risk of long-term effects. Tell your doctor immediately if you notice any changes to your body while taking Yervoy so they can offer quick and effective treatment. Research on the effects of Yervoy in mesothelioma patients is in the very early stages, but the initial results are quite promising. In June 2017, French researchers announced early results of a phase II clinical trial of Yervoy and Opdivo. 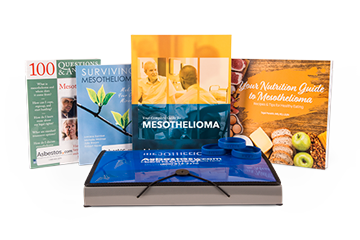 All participants in the study had inoperable mesothelioma that had returned following one or two lines of chemotherapy with pemetrexed and cisplatin or carboplatin. Approximately 50 percent of the 54 participants who were treated with the immunotherapy drug combination responded well. Tumors shrunk in nearly 26 percent of patients and another 24 percent of patients showed no new tumor growth. Results such as these are uncanny in the treatment of recurring mesothelioma. The cancer is known for its resistance to treatment, and these results have researchers excited for what future studies may hold for the mesothelioma community. Other clinical trials are evaluating Yervoy as a part of multimodal therapy for people with recurring mesothelioma, in addition to combining it with Opdivo and other immunotherapy drugs. The impressive results of the French trial prompted Bristol-Myers Squibb to fund a phase III study of Yervoy and Opdivo that is set to involve 600 mesothelioma patients in 20 countries. Seventeen U.S. cancer centers are involved in the trial including Moffitt Cancer Center in Tampa, Florida, University of Chicago Cancer Center and the Mayo Clinic in Rochester, Minnesota. Lead investigator of the study, Dr. Patrick Ma, has high hopes for the clinical trial. “We’re ultimately hoping [with this trial] to forge a new standard of care for mesothelioma,” Ma said. American Society of Clinical Oncology. (2017, June 5). Immune Checkpoint Inhibition Shows Promise in Relapsing Malignant Pleural Mesothelioma. Dana-Farber Cancer Institute. (2017, May 22). What Is CTLA-4 and How Does it Work in Treating Metastatic Melanoma? ESMO. (2015, November 3). FDA approves Yervoy to reduce the risk of melanoma returning after surgery. ClinicalTrials.gov. (2017, September 20). Nivolumab Monotherapy or Nivolumab Plus Ipilimumab, for Unresectable Malignant Pleural Mesothelioma (MPM) Patients (MAPS2). ClinicalTrials.gov. (2017, August 3). Phase 1/2 Study Exploring the Safety, Tolerability, and Efficacy of INCAGN01876 Combined With Immune Therapies in Advanced or Metastatic Malignancies. ClinicalTrials.gov. (2017, August 9). A Study Exploring the Safety and Efficacy of INCAGN01949 in Combination With Immune Therapies in Advanced or Metastatic Malignancies. ClinicalTrials.gov. (2017, December 13). Study of Nivolumab Combined With Ipilimumab Versus Pemetrexed and Cisplatin or Carboplatin as First Line Therapy in Unresectable Pleural Mesothelioma Patients (CheckMate743). ClinicalTrials.gov. (2017, September 14). Ipilimumab and Nivolumab in the Treatment of Malignant Pleural Mesothelioma (INITIATE). Bristol-Myers Squibb. (2017). What is Yervoy?